This week we find ourselves back in St. Luke’s Gospel, with Jesus continuing His journey to Jerusalem, to suffer and die for us. Our text finds our Lord reclining at table in the house of a ruler of the Pharisees. As Jesus traveled spreading the Good News, preaching repentance and the forgiveness of sins, it was His practice to preach also in the synagogues on the Sabbath. Often, someone who heard Him would invite Him over for dinner. Earlier in the Gospel, it was Levi the tax collector. A couple times it was a Pharisee. And now, this time, a ruler of the Pharisees. At first, the Pharisees invited Jesus to see if He was the real deal. But, now, the text says, they were watching Him closely so that they might have something to accuse Him over. We turn now to what happened next. As our Lord looked around, He noticed how those who were invited would seat themselves in places of honor – each of them jockeying for the most prestigious seats. Jesus told them a parable to the effect that they ought not to choose places of honor for themselves, but rather live in humility. He summed up the teaching with this key passage, “Everyone who exalts himself will be humbled, and he who humbles himself will be exalted.” Today, we confess that as our Lord humbled Himself, we also are called to humble ourselves before God and live out that humility in love toward others. On a first reading of this passage, it’s easy to breeze through and move on. We get that it’s about humility. We get that the guests were wrong to deliberate and choose for themselves the places of honor. The same point was brought up in both of the other texts today, as well. Something we said a few weeks back on Mission Sunday was that all of Scripture is about Jesus. On the road to Emmaus, Jesus went through all the Law, the Prophets, and Psalms and explained that they were about Him. So, I’d like us to consider first how this passage is about Jesus. The point of His humiliation was so that He might accomplish the work of salvation for us. Because of the Fall and by our own sinful nature, we are unable to save ourselves. We are incapable of contributing a single thought, word, or deed, to our own salvation. Instead, Jesus did it all. And, He gives His salvation as a gift through faith. He gives salvation to those who humbly confess their sins and look to Him for forgiveness. So that we might confess our sins, He gives us His Law and pastors to preach that Law, so that we might recognize from the Commandments how we have sinned and humbly repent. Through pastors, He also preaches the Gospel, where we learn that though our sins are like scarlet, in His blood we are made white as snow. So that we might this mindset, that we stand as beggars before God, Jesus reminds us, “Everyone who exalts himself will be humbled, but he who humbles himself will be exalted.” Remember the tax collector and the Pharisee. We’ve learned now how this text first applies to Jesus. Jesus is the prime example of humility. He set aside His glory for a time to become the ultimate servant, even unto death. Then, He who humbled Himself was exalted by God the Father when He was raised from the dead and seated at the right hand of the majesty on high. Now, how does this passage concern us? As we’ve discussed already, the goal of this text is that we would learn from it to be humble. First, we are to be humble before God. It’s not because of how good we all are that we gather on Sunday mornings, but because of how sinful we all are. We have all sinned, and do sin continually. Yet, by the Holy Spirit we have been brought to confess our sins and receive forgiveness. Even this very morning. When we see the punishment Christ endured, we know from Scripture that that punishment was the earned reward for our unrighteousness. Therefore, we always pray that God continue to create clean hearts within us. Second, humility before God is lived out in humility toward others. That was the malfunction of the Pharisees that prompted this teaching from Jesus. The Greek says that they were all choosing for themselves the places of honor. Each person was considering himself in relation to the others, and reaching the conclusion that they were the best, most honorable person in the room and that the others should give place to them. Such happens among us also in our thoughts and our words, when we, too, look around and consider ourselves as of higher standing than everyone else. We forget St. Paul’s words that there is one body and one Spirit, and we were all called to one and the same hope in Christ. The readings this week direct our minds to the mind of Christ. He didn’t consider His position as God and disregard our lowliness. Instead, He set aside His glory and honor to suffer and die in our place, for our salvation. Though we deserve nothing but wrath and punishment, our sins are forgiven by God’s grace. Therefore, we are called to be humble before God. May our Lord Christ, by the Holy Spirit, grant us always a contrite and willing spirit, that we, too, would consider less of ourselves and more of our neighbors. May the mercy we’ve received also be lived out in humility and love for our neighbor. Mark 2 and Galatians 5. Is. 53:2 and Matt. 8:20. “Let each of you look not only to his own interests, but also to the interests of others. Have this mind among yourselves, which is yours in Christ Jesus, who, though he was in the form of God…emptied himself, by taking the form of a servant.” With these words St. Paul encouraged the Philippian congregation in their life together as brothers and sisters in Christ. The young congregation was buckling under pressure. They faced pressure from outside, from the surrounding Roman culture that constantly challenged and belittled their faith. And they faced conflict within the congregation. The outside pressure from the surrounding culture started to tear away at the bond of love that existed between the beloved of Christ. They were thinking more highly of themselves than each other and less of those who lived and worked around them. Under pressure, the allure of false teaching became harder to resist, and some were resorting to legalism to get them out of their mess. St. Paul’s pastoral eye cut right to the chase; under pressure from the world and each other, the congregation lost sight of its Master, Jesus. He did not pride Himself on being God. He truly could demand the loyalty and servitude of all Creation, yet He didn’t. He humbled Himself by voluntarily refraining from His power and majesty and taking upon Himself our human flesh. He became subject to the Law and was obedient even unto death on a cross. In the Torah it says that those who are hung on a tree are cursed by God. Christ took that curse upon Himself. Jesus Christ humbled Himself so that He might redeem us from our sins and so that we might live in love toward one another. The Philippian congregation was, perhaps like us, a smaller congregation. It was founded when St. Paul, Silas, and Timothy visited the Roman colony during the Second Missionary Journey, about 49-51 A.D. Philippi was not the biggest city in the district, but it was prestigious. The citizens of Philippi were afforded all the same rights and privileges as if they were living in Rome herself. This was reflected in the culture. It was very cosmopolitan. As a society, infidelity in marriage was to be expected and pagan worship was the norm. As result, the congregation faced challenges in its call to be faithful to God’s Word. In Philippi, Paul and Silas were unjustly imprisoned after they had cast a fortune-telling demon out of a slave girl. The demon was making the her owners money, you see. Even with this conflict, the Philippians were known to be a generous congregation. They, largely, funded the mission work among the Corinthians by giving over and above what could’ve been expected of them. Their generosity flowed out of the love they had received from Christ, but it didn’t divert the pressure they were under. As we said, Philippi was a Roman colony. Things there were as you would expect – not friendly to the Christian faith. So, when the members of the congregation didn’t go to the pagan temples and were faithful to their spouses, the surrounding culture did not appreciate that and, in fact, was hostile to them. Within the congregation, that external pressure was certainly felt. We experience the same. We know what it’s like to have our society largely disagree with our confession of faith. We know that pressure, so we should recognize what happened with the Philippians. They started arguing. Rivalry and jealousy were very present. Things were done not in service of the Gospel, but of oneself. In general, everyone was exalting their position by putting down their brother in Christ. Some in the congregation also turned to false doctrine, hoping that a teaching that was more in line with the culture would save them. It wouldn’t. But, rather than rest on His laurels and pride Himself on the fact that all things must obey Him, He humbled Himself. St. Paul says that He emptied Himself and took on the form of a servant. This means that Jesus Christ willingly, for a time, refrained from using His eternal power, glory, and authority, and He took on our human flesh. He who deserves above all things to be served, came to serve and give His life as a ransom for many. He became obedient to the Law, perfectly submitting Himself to God and neighbor. He committed no sin and spoke no deceit. Yet, He was numbered with the transgressors. He poured out His soul unto death, even death on a cross. Scripture says, “Cursed is everyone who is hanged on a tree.” Christ willingly took that curse upon Himself, which we also confess this Palm Sunday. Jesus Christ humbled Himself, obeyed the Law, and still died in our place to save us from our sins and has enabled by the Holy Spirit to live in love. Though we, by nature, are prone to fighting and insults, to lies and arrogance, to distrust and disunity, that has all been put away through the death of Christ and our Baptism into it. As we’ll hear next week, through Christ’s resurrection the old leaven of malice and evil is put away and we celebrate with the unleavened bread of sincerity and truth. These things St. Paul called to the minds of the Philippian congregation. Their fearful infighting was not right. Christ died to forgive them those sins – and they are forgiven – and they are enabled through Him to live in love. They are to look to Jesus Christ for both the example and the strength to live in love. Were the Philippians, after Paul’s letter, perfect at this? Probably not. Still, Polycarp, who was a disciple of St. John wrote this to them some fifty years later, “I have greatly rejoiced with you in our Lord Jesus Christ, because ye have followed the example of true love…and because the strong root of your faith, spoken of in days long gone by, endureth even until now.” St. Paul’s confidence in the congregation and his encouragement for all Christians is found in the opening of this letter, “I am sure of this, that he who began a good work in you will bring it to completion at the day of Jesus Christ.” May Christ our Lord grant us the same grace as the Philippians, that we may give thanks for all His benefits and live in love – especially in the coming Easter season. Philippians 2:4-7, English Standard Version. “Hosanna!” They cried. “Save us, now.” Tens, dozens, maybe hundreds of people, all gathering in Jerusalem. The time for the Passover had come, and many had come into town for the annual festival. Some had come from Galilee, others from farther. Wherever they came from, they gathered at the gate with palm branches in hand to see this coming king, Jesus. “Save us,” They cried. Save us like you did the wedding at Cana when they ran out of wine. Save us like you did for the five thousand, whom you fed in the wilderness with only five loaves and two fish. Save us, and get these Romans off our back. Save us like you did Lazarus, who was dead for 4 days but now is alive. Save us, they cried, but little did they know what that meant. Hosanna to the one coming in the name of the Lord, even the King of Israel. Surely Jesus heard these cries, and here on Palm Sunday wasn’t the only time that the people pleaded with Him to become King, or threaten to make Him one by force. History has shown us many who would delight in the situation, those who would capitalize on it. They would ride in on a great big horse, rouse all of the people and take back the land for the people – or for themselves. But Jesus, He rides in on a young donkey. Just as it is written, “Fear not, daughter of Zion; behold, your king is coming, sitting on a donkey’s colt.” Not with the bearing of a king does Jesus come, but with humility. As a servant. Humbly, Jesus our King, rides to cross to bear our sin and win our salvation. Enraged at the raising of Lazarus, the Pharisees put out word that anyone who saw Jesus should let them know – so they could arrest Him. This made many wonder whether Jesus would actually come to the Passover, but here He is. And it’s not just Him, but by the Pharisees’ own admission, the whole world has gone out after Him. We see here that not all of the Jews are out to kill Jesus. There were many, many, faithful who recognized that Jesus is the promised Messiah long-hoped for. The group at the triumphal entry was a mixture. Some were there mainly for the Passover. The festival itself wouldn’t be for a bit yet, but lots came early to purify themselves beforehand. Others were there to see Jesus. They had heard of all the signs that He had done and they, like the Greeks who would come to Philip in the following verses, wanted to see for themselves this King of Israel. This was, probably in no small part, thanks to the crowd that had witnessed Lazarus rising from the dead. The text says that, despite what the Pharisees were planning against Jesus and His followers, that crowd continued to bear witness to all that they had seen. This King of Israel was no ordinary king; He had the power to save, even from the grave. And so they cried, “Hosanna!” Save us now, blessed King coming in the name of the Lord. Save us, O King. Save us from trial and tribulation. Save us from these oppressive Romans. Save us from hunger and thirst. Save us, and act like the King of Israel that you are! Amidst their cries for glory and salvation, the true King of glory comes forth. The text says, “Jesus found a young donkey and sat on it.” This was to fulfill the prophecy from Zechariah 9, our Old Testament reading, which the Evangelist cites, “Fear not, daughter of Zion; behold, your king is coming, sitting on a donkey’s colt!” Humbly, Jesus rode into Jerusalem to accomplish our salvation. He did not come in pomp or fanciness. He knew what He must do so that the daughter of Zion, a term for God’s chosen people, may live without fear. Humbly, Jesus rode into Jerusalem on a donkey, a beast of burden, even as He Himself is a beast of burden on our behalf. He was born without sin, conceived by the Holy Spirit and the Virgin Mary. There was no deceit in His mouth nor did He bear iniquity in His actions. His life was a perfect and complete fulfillment of God’s Law. And now, in perfect submission to the Father’s will, Jesus rides to His own death on our behalf. While the crowds cry out, laugh, and cheer, Jesus knows the real purpose of it all – their salvation. He knew that in just a short time crowds would be crying out for His blood. In true kingly fashion He would receive a crown, only His was made of thorns, pushed on His head to bring out that much more blood. In just a short time He would die. Why – for sins that He committed? No – for sins that we committed, and ones that we still do. Our sins put Him there. Our demands for glory, our demands for a life full of pleasure and happiness, our demands for freedom and independence caused He who came to give life to all to give up His own. “Hosanna,” They cried. The words that we hear from Scripture are the same for them, “Fear not, daughter of Zion; behold, your king is coming.” “Rejoice greatly, O daughter of Zion! Shout aloud, O daughter of Jerusalem! Behold, your king is coming to you; righteous and having salvation is he, humble and mounted on a donkey, on a colt, the foal of a donkey.” Rejoice, it says. Rejoice and shout aloud, for the King, your King, is coming. Not like kings of the world does He come, but as the humble Son of God. Into Jerusalem He rides for our salvation. As the Disciples did not understand these things at the time, so does this fly in the face of our sinful nature. We’re so used to pictures of Jesus with a halo, the glorified Jesus, that we sometimes miss the humble Jesus. 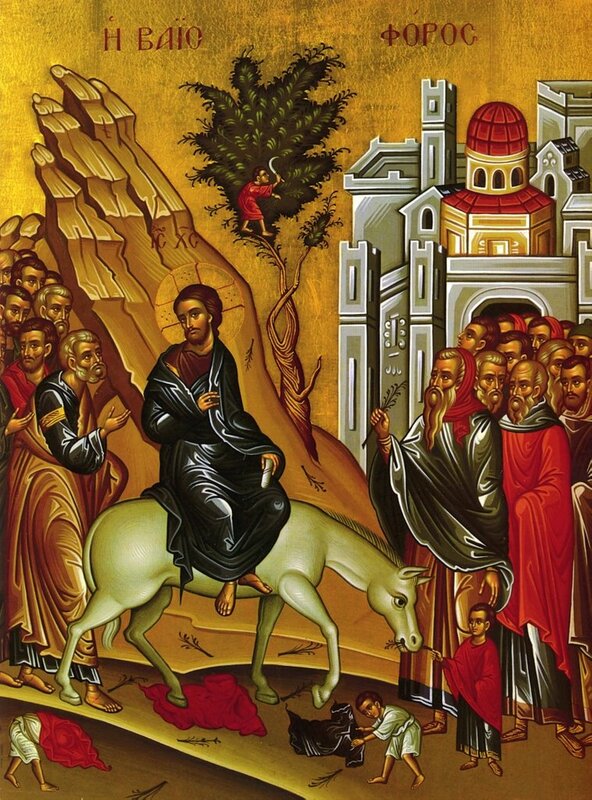 This humble King rode into Jerusalem on a donkey, amidst glorious shouts, knowing full well that He rides on to His death. He went to fulfill all Scripture, to prove the His Word is true, to die for you. He went to comfort those who dwell in darkness and the shadow of death and to bring them out of fear. “Hosanna,” we cry. Save us, we pray to Jesus that He would rescue us from the perils and pitfalls of this world. And save us, He does. Ride on, ride on in majesty. In lowly pomp ride on to die. O Christ, Thy triumphs now begin o’er captive death and conquered sin. Ride on, ride on in majesty. In lowly pomp ride on to die. Bow Thy meek head to mortal pain, then take, O God Thy pow’r and reign. The Holy Bible: English Standard Version (Wheaton: Standard Bible Society, 2001), John 12:15. It is great, and we’re certainly glad that they are still happily married, but let us contrast their entrance with the entrance of the King of the Universe into Jerusalem as we have in our Gospel text. Jesus did not ride in on a gold chariot, He didn’t call for pomp and circumstance, He didn’t even ride in on a horse and saddle. Instead, He rode into Jerusalem on a humble donkey, a beast of burden, even as He came in carrying the burden of our sin. Humbly Jesus rode into Jerusalem to accomplish our salvation. We remember that especially this Advent and the beginning of the new church year. “Now when they drew near to Jerusalem, to Bethphage and Bethany, at the Mount of Olives, Jesus sent two of his disciples and said to them, ‘Go into the village in front of you, and immediately as you enter it you will find a colt tied, on which no one has ever sat. Untie it and bring it. If anyone says to you, ‘Why are you doing this?’ say, ‘The Lord has need of it and will send it back here immediately.’’ And they went away and found a colt tied at a door outside in the street, and they untied it.” As Jesus and His disciples drew near to Jerusalem everything had already begun to fall into place. Though He was familiar with Bethany, as that is where Mary, Martha, and Lazarus were from, Jesus knew that this time would be different. Passing through the Mount of Olives, He knew that this location would be the site of His betrayal by one of His own disciples. In addition to knowing all things, Jesus showed that He was all powerful by His many miracles. The Gospels are filled with the works of Jesus – healing people, raising the dead, and forgiving their sins. These things were written so that we may believe that Jesus is the Son of God. But even being the Son of God, Jesus did not count that as something to be held onto. Rather, He emptied Himself of His glory and took upon the form of a servant, being born of the Virgin Mary. Instead of coming in glory, He came humbly to bear our sin. The Son of God rode humbly into Jerusalem to die a murder’s death. Jesus rode into Jerusalem on a donkey, not with the pomp of kings, and yet that is exactly what He is. He comes in bringing His reward – the forgiveness of sins, life, and salvation – purchased by His own blood on the cross. He rode into Jerusalem to accomplish our salvation and to fulfill the prophetic promises of God throughout the Old Testament. By His death He crushed the powers of sin, death, and Satan, thereby crushing the head of the ancient serpent as promised in Genesis 3. He is the fulfillment of the promise made to Abraham, that in his offspring all nations shall be blessed, foreshadowed as well by the sacrifice of Isaac. The people spread their cloaks and palm branches on the road before Jesus, proclaiming the coming kingdom of their father David. Jesus is the heir promised to David, whose throne is established forever. He is the promised prince David from our Ezekiel reading last week (34) and as God says in Ezekiel 37, “David my servant shall be their prince forever.” Jesus rode into Jerusalem as the fulfillment of all prophecy. He rode into Jerusalem on a donkey as the humble Son of God to accomplish our salvation. He rode into Jerusalem as the prophesied king, the fulfillment of all Old Testament messianic prophecy. And now, as we begin this Advent season and the entire church year, Christ, our savior, rides in again for our salvation. Though, instead of Jerusalem, Jesus comes here. As He was faithful to the witness and promises of God in the Old Testament, so is Jesus faithful to His promises in the New. Jesus promised that even though He goes to prepare a place for us in heaven, He would never leave us destitute or alone. Instead, He promised to never forsake us, to be with us always. He promised to be wherever two or three are gathered in His name and sent His Holy Spirit, the Comforter, into our hearts to work faith and as a guarantee of our salvation. Because Jesus is the Son of God, shown by His power and miracles and fulfillment of prophecy, He is able to make good. Soon we will sing in the closing hymn, “Savior of the nations, come. Virgin’s Son, make here Your home! Marvel now, O heav’n and earth, that the Lord chose such a birth.” We know that as Jesus rode into Jerusalem on a donkey, humbly and not with any sort of fanciness, He rode in as the Son of God, the promised Messiah and King, to accomplish our salvation. This Jesus also comes to us even now with His grace and forgiveness, for He is the Author of life itself. The Holy Bible: English Standard Version (Wheaton: Standard Bible Society, 2001), Mk. 11:1–4.